Can I Play Oz Lotto Online? Read 2 Reviews! I just found a new way to chase away those Tuesday blues away. Australia’s Oz Lotto seems to be just the thing. It’s an official lottery with some pretty good odds. It has a minimum jackpot of AUD 2 million that rolls over and grows until it won. Check out the four multimillionaires that took home AUD 27 million each in November 2012. This is a fairly straightforward lottery where players chose 7 numbers from 1 to 45. The total balls drawn on Tuesday are seven regular balls and 2 bonus balls (called officially supplementary balls). These bonus balls come into play for 2nd, 4th and 7th prize (3 numbers and one of the bonus balls). What Can I Win at Oz Lotto? The advertised amount of that week’s jackpot is split for the 7 tiers. 40% goes to the winning 7 numbers, and it is shared if there is more than one winner. This jackpot is guaranteed at a minimum of AUD 2 million, though it usually is more. It’s a rollover jackpot that grows each week until won – there is no limit. When it isn’t won, it grows faster and faster as more people jump on the bandwagon. Of course for all those that do decide to jump on the bandwagon, the first thing they should do is read through the rules and regulations – not! I did read through the 46 pages of information to see if there were any surprises and happily there are not. This is a very straightforward lottery that is governed and run by Tatts out of Australia, and these guys are professionals. See the time I just saved you. 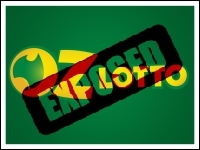 LottoExposed.com can help make playing Oz Lotto fun and easy. Oz Lotto on the ground offers a bunch of different options on how to pick your numbers. There is the usual manual take your favorite numbers and play. Oz Lotto also offers the typical quick pick where a player lets the system pick the numbers. They have several other combinations of plays, but mostly this is for people on the ground. Frankly, I got darn right confused with all the different options. I’m not a mathematician, so I can’t even begin to figure out the odds and why this might make winning easier. There are the usual warnings online regarding people who use the name of Oz Lotto by email, snail mail and telephone for either identity theft or to scam processing fees and/or taxes from people because ‘they have won.’ The basic rule of thumb here is that if you haven’t bought a ticket, there is no way you have won. There are contact details people are encouraged to report any misrepresentation by either a person or a company. Tatts Group offers a heap of different contact points for FAQ by email only. The big thing to remember is these guys have been around the block and are legally responsible for quite a few of the Australian lotteries and other games including horse race and sports betting. They are serious about being professional. Who Can Play Oz Lotto? There doesn’t seem to be any restrictions on who can play Oz Lotto except you must be 18 years of age or older. It is recommended that if you are outside of Australia, that you use one of the online lottery concierge services as they will ensure the processing side of winning. The whole legal jurisdiction of playing lotteries is still an unfolding process (meaning still pretty new), so I figure it is safer to leave it to the professionals. Would you mind rating Oz Lotto? I like the fact that this lottery is on Tuesday. It’s always been one of my blah days. It’s a good size jackpot with an excellent range of other prizes to win. It’s run by professionals who have been in the industry for a long time and know what they are doing. Our team gives this Oz Lotto a thumbs up. It’s not one of the huge ones, then again, it offers pretty good odds. It’s a rollover lottery, which means that if it isn’t won, it grows and grows fast! How Much Does It Cost to Play Oz Lotto Online? Just to correct the record. OZ Lotto is conducted by the Australian Lotto Block of which the Tatts Company would be the major stakeholder. The operator in Western Australia is Lotterywest (The WA Lotteries Commission) answerable to the State Government. ALL profits from Lotterywest games are given out in Grants to Western Australian Charities whereas Tatts pay a royalty to various State/Territory governments with profits going to Tatts shareholders not charity. In Western Australia the legal age to play Lottery games is 16. You are right, Tuesdays have never been the same for me since I started playing the Oz Lotto. I used to live in Australia and even when I moved back home to the UK I am still able to play online through an agent. I like the quick pick option too.